Musharraf’s days (hours) are numbered. There are already calls for his resignation from the opposition. 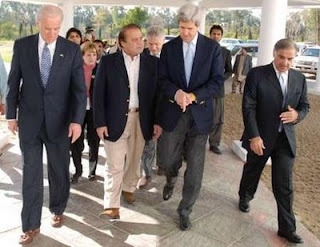 Senators Kerry, Biden and Hagel hung out with former Prime Minister Nawaz Sharif yesterday. Sharif tried to impose Islamic Law on the nation and has reportedly met with Osama Bin Laden several times. Senator Joe Biden announced before the votes were counted that if Musharraf’s party won then the vote would be flawed. …Nice neutral observations there by Senator Joe. ISLAMABAD, Pakistan – There was a growing clamour for President Pervez Musharraf to resign Tuesday, after parties which support his military government, which has close ties to the United States, were routed by opposition parties in parliamentary elections Monday. Mr Musharraf’s political survival now depends on his ability to forge a power-sharing deal with Miss Bhutto’s widower, Asif Ali Zardari, the co-chairman of her Pakistan’s People’s Party (PPP). Mr Sharif (another opposition leader), whose supporters may have captured the pivotal province of Punjab once full results are known, called on Mr Musharraf to listen to the “verdict” of the people in yesterday’s election and step down. He pledged to work with other opposition groups including the PPP to “rid Pakistan of dictatorship forever”. It is interesting that Sharif says he wants true democracy today but when he was prime minister he removed all governmental checks on his power. The PPP (Bhutto) is in red. The PML (N) is in blue (Sharif). Musharraf’s party the PML (Q) is in green.